Varicose veins, spider veins, and a variety of other vein conditions can cause a lot of discomfort, both physically and mentally. Those who suffer from a vein condition cannot only experience pain, but they can also feel embarrassed or self-conscious about the way their veins look. For this reason, many patients choose to cover up their condition by wearing pants or compression stockings. You shouldn’t have to suffer from painful and uncomfortable vein conditions, which is why in today’s post, we will discuss why winter is the best season to finally receive the vein treatment you deserve. If you’ve made the decision to treat your varicose or spider veins this winter, the Center for Advanced Vein Care in Cleveland can provide you with the expert treatments you need. We offer a wide selection of treatments, including minimally invasive treatments like ultrasound guided sclerotherapy, radiofrequency thermal ablation, and endovenous laser ablation. Browse our website to learn more about the conditions we treat and the treatment options we offer, and give us a call to schedule a free screening today! Compression stockings are a great tool that can help you find relief before and after you receive your vein treatment. In fact, after most vein treatments, doctors will request that you wear compression stockings to help your blood circulate naturally. While compression socks are available in a wide variety of colors and styles, many patients feel uncomfortable wearing them with shorts during the warmer months of the year. 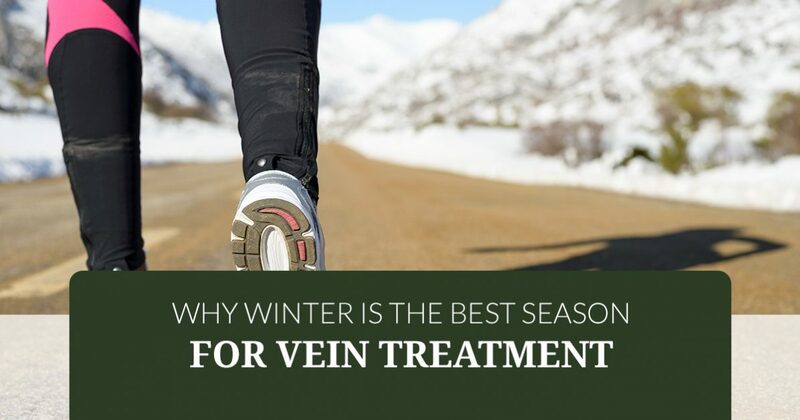 For this reason, winter is a great time of year to receive vein treatment. With the winter season comes colder temperatures that allow you to bundle up in warm sweaters and long pants. Once you receive your vein treatment, you will be able to hide your compression stockings under long, comfy pants, allowing you to find relief and comfort. When you seek treatment for your varicose or spider veins, one of the side effects you need to watch for is discoloration to the treated area. Discoloration is common when the treated areas are exposed to sunlight, which is why doctors recommend that their patients cover up the treated areas for the first couple of weeks following treatment. Another reason winter is a great time to receive the vein treatment you need is because you don’t have to worry about taking extra measures to cover up the treated areas. During the spring and summer months, the temperatures are high, and the last thing you probably want to do is dress in layers. However, dressing in layers during the winter isn’t a problem, therefore your skin is less likely to be exposed to sun rays that will cause discoloration. If you have varicose veins, you are more likely to experience pain and irritation during the winter season due to inactivity. Pain and irritation are also common during the warmer months, but constant activity such as walking, hiking, and moving around can help ease some of the irritation and get your blood moving. During the winter months, you most likely don’t move around as much, which is why you may experience more pain or irritation. For this reason, you may want to consider receiving vein treatment at the very beginning of the winter season. This will allow you to treat the problem before it has a chance to cause you any more pain or discomfort. The warmer months are a great time to shed the heavy sweaters and long pants in exchange for lighter materials and shorts. However, if you have varicose or spider veins, you may not feel comfortable showing off your legs for everyone to see. Another reason you may want to receive vein treatment during the winter is because it gives you plenty of time to heal and recover, giving you the freedom of wearing whatever you want when spring and summer finally arrive! Interested in Receiving Vein Treatment? If you’re ready to finally stop the pain and discomfort that has kept you from living your life to its full potential, Dr. Sonja Stiller can provide you with the vein treatment you deserve at the Center for Advanced Vein Care. We treat a wide range of conditions and we offer a selection of treatment options to meet your needs and budget. Interested in learning more? Browse our website to see what we have to offer and contact the Center for Advanced Vein Care today to schedule a consultation at our Cleveland clinic.